Knowing that I am really interested in the subject of strength many of those whom I meet--even chance acquaintances--will bring the conversation around to physical matters. One young man, a finely-developed chap, asked me to explain why he was not as strong as other men whose muscles were no bigger than his. 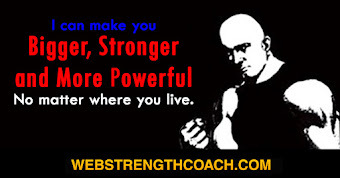 Of course the answer was complicated, for there are so many different elements in strength. A man may have strong muscles but utterly lack any knowledge of applying his strength, so that he makes a poor showing against experts. He may have a one-sided, or unsymmetrical, development that makes him good at some tests and poor at others. But generally the explanation lies in the quality of the muscles. A muscle can be of high or low quality, just as may a steel spring. You can buy a steel spring which will have a certain degree of springiness, but which will ordinarily lose that quality under the strain of use. And you can buy another spring of exactly the same weight and thickness which will have twice as much resiliency, and which will last indefinitely. The difference lies in the quality of the material and the superior process of manufacture. You can take a piece of iron and by treating it in a certain manner, and by forging and reforging it, can convert it into steel, and make it several times as strong as it was before, without adding a particle to its bulk. There is a way of developing muscle, which gives added size but surprisingly little added strength. There is another way which adds to the muscle's strength and leaves the size to take care of itself. And there is a third, and it seems to me an ideal way, which not only brings a muscle to its maximum size and greatest beauty of outline but also gives it enormous contractible power. The size of a muscle is of course dependent on the number and thickness of the individual fibres which compose it; and size can be produced more easily than can strength. Just as the mind can be developed by giving it progressively harder problems to solve, so can the muscles be built up by teaching them to contract against progressively greater resistance. Take any man or boy who has drifted into the habit of using his muscles as little as possible. Start him with mild exercise and then gradually give him more, or longer or harder exercise, and his muscles will steadily grow in size and strength until the natural maximum is reached. 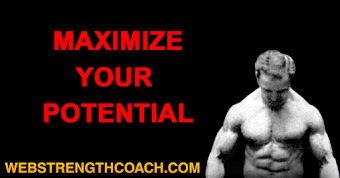 The last few years have witnessed the growth of a great interest in muscular development for its own sake. There is a way of producing muscular tissue in large quantities, of making various individual muscles big and shapely, but without adding very much to the strength of the muscle. This method, which is called by several different names, is really a system of development from "extreme contractions." It is fascinating, because of the ease with which muscle is created, and disappointing by reason of the little strength that it brings. Undoubtedly it has its origin in light dumb-bell exercise. It soon became apparent that if a man used in his exercise a pair of 2-pound dumb-bells, the resistance offered by such light weight was not sufficient to make the muscles really work. So the work was made harder in the following way: at the end of any movement the muscle was vigorously tensed by an effort of the will. This made the muscle contract to its full extent and it soon appeared that the more intense the mental concentration on the act of tensing the muscle, the more rapidly the muscle would grow. The importance of the voluntary tensing overshadowed the value of the weights used; and so the small dumb-bells were discarded as they added nothing to the effectiveness of the method. To explain. If you clinch your fist, bend your arm, and bring your hand close to your shoulder the muscles called into play are the flexors of the arm of which the principal one is the biceps muscle. Now, after the arm is bent, try and harden the biceps so as to make it stick up in rounded lump. Repeat several times, and your biceps will turn and get slightly sore. Do this every day for a month, and by the end of that time you will notice a considerable difference in the size of the muscle, especially when it is under tension. From day to day you will be able to put more force into the final contraction; and as that is a form of work each day the biceps will grow slightly larger. If you keep it up long enough you will get so that you can make the biceps protrude in a very imposing lump indeed. Exactly the same thing can be done with most of the voluntary muscles. All you have to do is to learn the position most advantageous to extreme contraction; and then tense the different muscles strongly by an effort of the will. When a muscle is tensed, or used, blood is drawn to it, which accounts for the increase in size. There are men who have obtained fairly big muscles in that way, but they never look really well-developed except when the muscles are tensed. When at rest these muscles, while fairly bulky, have a placid appearance; and entirely lack the clear-cut and shapely outlines that come from doing real muscular work. A muscle so built up, when flexed to its fullest extent, will show a pronounced ridge, or hump, at its center portion--that is, midway between the tendons, or attachments. The biceps, for example, will stick up almost in a point, instead of in a high curve. When relaxed the muscles are large only in the center and taper sharply to the points where they join the tendons; and the tendons themselves are not affected or strengthened by this method of development. A man who has developed himself by real work has muscles of an entirely different shape, and of vastly greater strength. 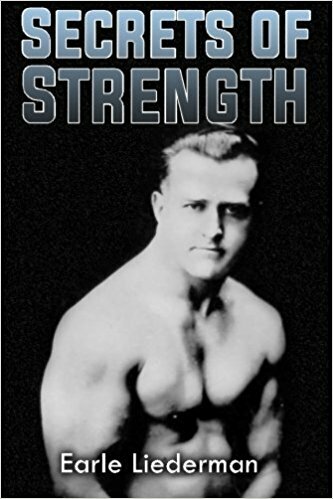 I have seen men with 15-inch arms developed through the extreme-contraction method, who had far less biceps strength than other men with 14-inch, developed through exercises like "chinning the bar," "curling" heavy dumb-bells, or other movements in which real work was done. In order to develop the greatest strength, a muscle must work against resistance through the whole range of contraction. When chinning a bar, the biceps muscles are continually at work, from the start when you commence to bend the arms, until the finish when your arms are doubled up. 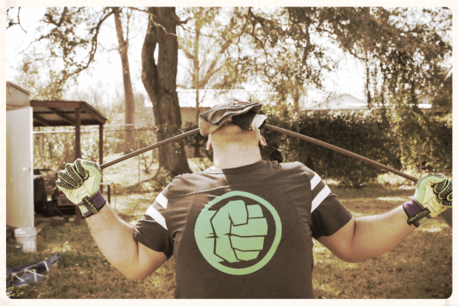 All through the movement the arm muscles are lifting the weight of the body; i.e., overcoming resistance. There are "strength athletes" whose whole interest is in the creation of high-quality muscles, and who care little about the appearance of their muscles. Their desire is to perform feats which require the maximum of muscular strength, and they deliberately train to increase the strength of the muscle, and allow the shape to take care of itself. What they care for is not how the muscle looks but what it will do. One of the best-known exponents of this theory was the late Arthur Saxon. 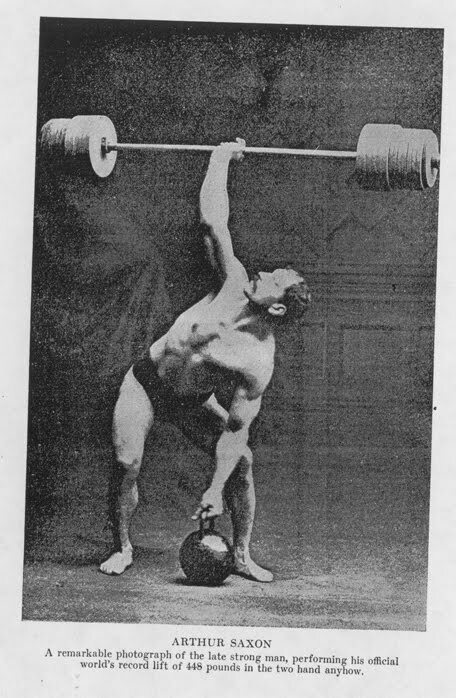 In some styles Saxon could lift more than any other man in athletic history. There is a lift known as a "one-arm-bent-press," which is the method used by experts when they wish to "put up" a very heavy weight. The art of the lift consists in using the body muscles to reinforce the arm. In fact, most of the elevating of the weight is accomplished by bending the body. I took a physician friend to watch Saxon perform, and when the "bent-press" was made, and Saxon's body was bent almost double to the side as he forced up a 314-pound weight, my friend exclaimed "that man must have phenomenally strong fascia." The "fascia" are the thin fibrous sheaths which enclose the muscles. In your arm there is a fascia almost like a tight sleeve, which lies right under the skin and holds all the muscles together. In the region of the hips and waist there are important fascia and I suppose it was to them that my friend had reference. You see he was not so much interested in the contractile strength of Saxon's muscles, as in the firmness of the fascia which prevented a displacement of the muscles of the waist region. Saxon himself spent a lot of time in strengthening his tendons. He knew that his public performances required a lot of energy, and his theory was that light exercises only tired him, without making him any stronger. 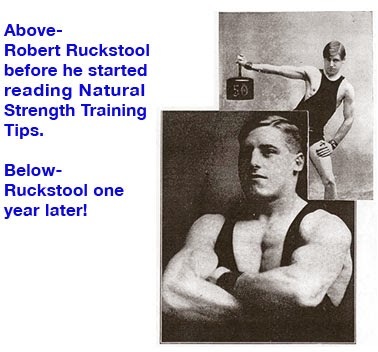 So when he practiced, he would do the sort of stunts which threw heavy work on the full length of the muscles, and on the tendons; such as the lifting, supporting and throwing around of enormous weights. And he would do each stunt only a very few times, and alternate his stunts with brief periods of rest, so as to prevent himself from tiring, and to conserve his energy. As a consequence Saxon was never what you would call a beautifully developed man, although he was well-shaped and had a very rugged appearance. His muscles were sinewy rather than of the beefy type. Particularly noticeable was the length of his muscles. The biceps of his arm, for instance, was big from its lower point in the bend of the elbow all the way up to where it disappeared under the deltoid at the arm-pit. The character of his work seemed to prevent any accumulation of fat, and his muscles were always plainly evident. No man ever made less effort to display his muscles, and yet few men have had stronger muscles. His upper arm measured about 17 inches when flexed, and his thigh about 24 inches; neither of which is extraordinary for a man who had a frame like his. His bones were about the average in size, but his tendons were much thicker than is usual; and I believe that the kind of work he did thickened and strengthened the tendons. Certainly I think that if he had cared for muscular development, he could have made his arms one inch, and his thighs two inches larger. With his bones and tendons he could have "bulked up" his muscles and, I feel quite sure, could have made them even stronger than they were. The Boston athlete, John Y. Smith, was a smaller man than Saxon but was of the same rugged, sinewy type and had muscles of the same shape and character. So far as I can find out, Smith's training method was the same as Saxon's; and in his youth Smith was America's leading amateur "Strong Man." 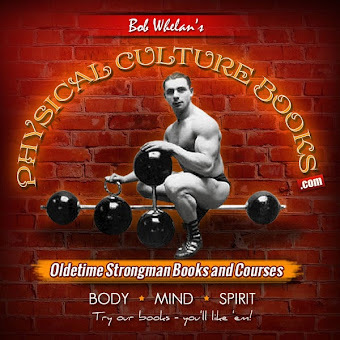 While I am an earnest advocate of muscle-culture, I am willing to admit that there are very strong individuals who possess great strength, but who show no pronounced muscular development. Assemble one hundred men accustomed to heavy labor and you are sure to find, in that hundred, at least three or four who are far beyond the others in respect to bodily strength. They may be big, or just average in height; but always they are thick-set and well-knit. Their muscles are big, but not of the well-defined kind that we associate with "Strong Men." And yet when it comes to moving a 2,000-pound log, loading a huge crate on a wagon, or carrying a piano up stairs, these men are "there with the goods." Their strength must be due to their educated tendons which have been gradually developed through years of the kind of work which calls for great and continual bodily exertion. The other day a friend told me of seeing a workman carry up one flight of stairs a bathtub weighing 1,500 pounds. Several men had to assist in getting the tub placed on his back, but once it was there he was able to walk away with it. When I asked what the man looked like, I was told that he was not very big, but extremely well-made, standing about 5 feet 8 inches in height and weighing about 180 pounds. I would like to be able to study that man's muscles so as to determine where his strength comes from. Anyone would be foolish who attempted to prove that only those are strong who go to gymnasiums, or who practice physical-culture. I know, for a fact, that many of the new-comers to the ranks of professional "Strong Men" are recruited from among those who have developed their unusual strength by doing labor. And even a few months of intensive muscle-culture will not necessarily make one as strong as another bigger man who has spent years developing his muscles in the course of his daily work. For my part, I am interested in the building of better bodies, I am more or less of an enthusiast on the question of muscular-development; and strength fascinates me. So quite naturally, I prefer a training method which promises results in all three directions--that at one and the same time improves a man's general build and his muscular development and increases his strength. In the line of ex, I prefer the kind that increases the muscular tissue, and strengthens the tendons. I like the kind of strength that can be converted into athletic ability, and I favor the variety of muscle that by its very shape proves that it has done work, and is capable of work. 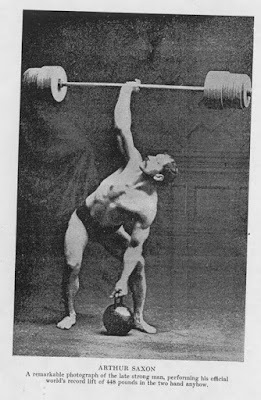 Happily we can find many cases where the maximum of strength is accompanied by superlative beauty of figure; as in Sandow, Rollon, Arco, Redam and other famous "muscle-men." My interest in the kind of muscle produced by different varieties of exercises explains why I encourage, and sometimes incite my pupils to competitions to determine which of them can do the most "pull-ups" on a horizontal-bar; the most "dips," stretch the most rubber strands, or lift a 50-pound dumb-bell overhead the greatest number of times. When the competitors submit their records along with pictures showing their development, it is interesting to observe the effect of a vigorous exercise in developing and shaping the set of muscles chiefly employed. You can build up any muscle, or group of muscles, if at regular intervals you give it exercise that is vigorous but not violent. "Vigorous" is somewhat indefinite, because an exercise which would be vigorous at the start, when you were undeveloped, might prove to be mild after you had gained in strength and development; and an exercise which would be dangerously violent for untrained muscles would later on, after those muscles had gotten big and strong, be perfectly safe and easy of accomplishment. So any well-thought-out training system involves the introduction of the "progressive" element, the increasing resistance offered, or the increased vigor of the movement, without which no great gains in strength or development can be made. The act of jumping affords us a very good example of the effects of violent versus vigorous exercise. For jumping can be used as an exercise, made violent or merely vigorous, and the resulting development bears a direct relation to the kind of jumping you have practiced. Jumping for extreme height is an exercise of the most violent character. When a man six feet tall clears a bar higher than his head, he performs a feat of strength which requires a powerful and spasmodic contraction of the leg and back muscles. All those trick-jumpers have wonderful thighs. And it does not seem to make a bit of difference whether their hips are wide or narrow, or if their bones are big or small. The man referred to above has a rather slender frame, which makes his thigh-development seem more wonderful by comparison. Also he is very strong, seemingly from possession of those legs, for he can lift heavy weights from the floor, and can carry heavy weights on his shoulder while he walks with a firm, even tread. The only other athletes who can equal the jumpers for thigh-development are some of the great fancy-dancers; and, after all what is fancy dancing but continual jumping and springing? Ground-tumblers, who practice hours daily at hand-springs, somersaults and like feats also get fine legs, because they use their leg muscles to propel their body weight. I am one of those who hold that the strength a man can exert is largely controlled by the strength of the thighs; which is why I am devoting so much space to them. Ask an experienced friend how to develop your thighs, and he will probably tell you that all that is necessary is to practice squatting (the so-called "deep-knee-bend"), in which you first bend the legs and sit on the heels, and then rise up by straightening the legs. You try it and it seems very vigorous at first, for after a couple of dozen squats your thigh muscles cry out for a rest or even refuse to work. But you persist and after a week's practice you can squat 50 times without much trouble, and your thighs seem to have grown bigger and improved in shape. At the end of two weeks you can make a hundred repetitions; and at the end of a couple of months, your limit is gauged only by your endurance. This is the common experience as there are men who can squat 1000, 1500 or even 2000 times without stopping. The disappointing thing is that at first your legs grew bigger and stronger rapidly, but when they reached a certain size the growth stopped; and they are not yet big enough to suit you. You may not have realized it, but the growth stopped just when the exercise ceased being one of strength and became one of endurance. According to our theory, the way to promote further growth is to make the resistance heavier and the repetitions less. This could be done either by resting a weight across your shoulders, or by squatting on one leg at a time. A still better way is to adopt the scheme of a young friend of mine. He had but a limited time in which to exercise and so had to concentrate. He made his squatting more vigorous by the simple expedient of jumping directly upward. As he stood up he would spring lightly upward; and as he landed lightly on the balls of his feet, would allow his knees to bend so that he would sink into the full squat, and from that position would again spring upward. So instead of the thigh muscles just raising the weight of the body to a standing position, they had to contract strongly enough to shoot his body up in the air. 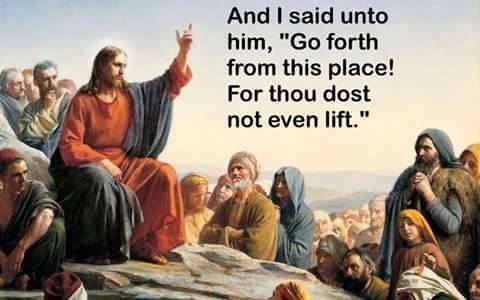 He claimed that 30 such jumps gave one as much work as ten times as many ordinary squats, and produced much bigger muscles. Certainly he has developed splendid thighs in that way. 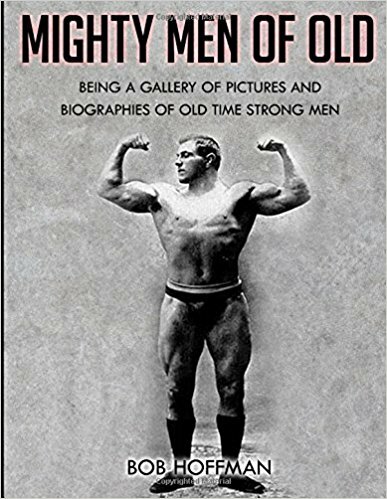 A couple of generations ago the first great American "Strong Man" adopted exactly the same principle to increase the size and development of his arms and upper body. This was the celebrated Doctor Winship, who was the Sandow of your grandfather's time. Winship lived at a time when there was no such thing as "home exercise," and so did all his training in one of those old-fashioned gymnasiums equipped with ladders, bars, rings, etc. A favorite exercise of his was to mount the under side of an inclined ladder by successive "chins." Instead of going up hand-over-hand he would grasp a rung with both hands, give a strong pull, let go of the rung, flash his hands up and catch the next bar above. This is much harder than pulling your weight up slowly, as you have to "jump" your weight up by a strong contraction of the arm muscles. Consequently it produces bigger and stronger muscles, just as jumping in the air as you arise from a squat gives bigger thigh muscles than mere squatting. To mount a ladder as Winship did teaches one the knack of strong muscular contractions, because, as you come near the top of the ladder, if you miss you will take a 15 or 20-foot fall. Winship's muscles grew rapidly in strength; so to give them harder work he would skip a rung at each jump. This produced strength so rapidly that ordinary chinning became child's play to him and to chin the bar with one arm was no trouble at ala. Then he went to going up the inclined ladder using only one arm; and eventually reached the point where he could give such a terrific pull that he could mount three rungs at a time. Think of the prodigious power he must have had. It takes a "Strong Man" to "chin" even once with one hand, but this Winship could actually pull so strongly with one arm that his whole body would be projected vertically upward. Probably he used similar schemes to develop the rest of his body. That his strength was not confined to his arms is shown by the fact that in his exhibitions he would lift from the floor with hands alone, a platform bearing a dozen 100-pound nail kegs. And to do that he must have had immense strength in the back and legs. 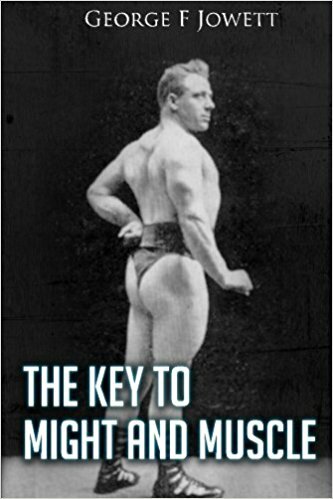 To achieve the maximum of strength and beauty, it is necessary to practice exercises which teach your muscles to contract strongly, so as to develop the muscle throughout its full length from tendon to tendon; which can be done either through the use of strong springs or strands, weights, or just the resistance furnished by your own body weight. In addition it is wise to practice a little at "extreme contraction" exercises. It is a great mistake to make your exercise too severe, or to make too much of it. If you wish to get the biggest and strongest muscles possible you will do better to make a few vigorous efforts than one violent one. Lifting a 300-pound weight from the ground six or eight times will develop the back more rapidly than lifting 500 pounds once. Stretching a 5-strand "exerciser" a dozen times will make the arm muscles bigger than doing the same thing only once or twice with a 7-strand; and much quicker than taking a 2-strander and stretching out 50 times.